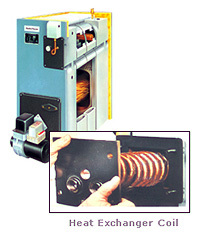 Tankless coil water heaters use the heat from a home's boiler to heat water just when it is needed. This is accomplished by a coil of pipe, which is immersed in the boiler water, acting as a heat exchanger, passing heat from the boiler's hot water to the cold water being drawn through it. The big advantage of tankless coil systems over storage units is they have no stand-by heat losses since water is heated only when needed. 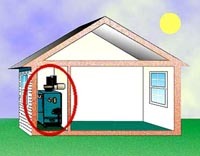 The big disadvantage of these systems is that the home's heating system must be operating for them to work, and in the summer, it's a waste to operate a heating system just to produce some hot water from time to time.